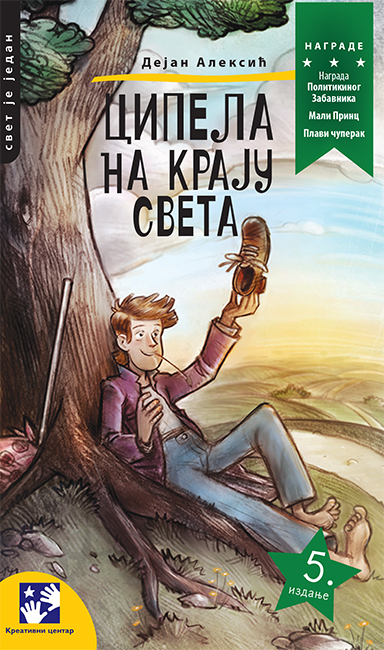 This metaphorical novel is the winner of the most prestigious literary awards for children in Serbia. On a lonely, curvy path, as lonely as if it were at the end of the world, there was a shoe. It lay there, with its sole, laces and a sticking tongue until a Vagabond who was passing by came across it. The Vagabond loved to go barefoot so the shoe was of no use to him, but as he was roaming the world and he was very keen on telling stories he realized at once that the shoe was hiding an unusual adventure. And when he found the note in the insides of the shoe saying: "The one who brings me to my owner will become rich" he was sure that the untold story was extremely interesting with lots of unordinary heroes and thrilling twists. This metaphorical novel is the winner of the most prestigious literary awards for children in Serbia. On a lonely, curvy path, as lonely as if it were at the end of the world, there was a shoe. It lay there, with its sole, laces and a sticking tongue until a Vagabond who was passing by came across it. The Vagabond loved to go barefoot so the shoe was of no use to him, but as he was roaming the world and he was very keen on telling stories he realised at once that the shoe was hiding an unusual adventure. And when he found the note in the insides of the shoe saying: "The one who brings me to my owner will become rich" he was sure that the untold story was extremely interesting with lots of unordinary heroes and thrilling twists.